There are seven different species of wasp in Britain and northern Europe, they all have the same general appearance with the black/yellow barring but vary in size. 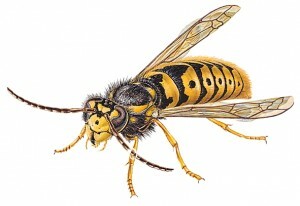 It is usually the Common, German and the Hornet which are normally seen in or around housing. Nest building is started by the queen in the spring and then continued by the workers. Typically nests can be built in wall cavities, attic spaces, trees and bushes, almost anywhere. Wasps are aggressive and unlike bees can deliver multiple stings. Wasp Pest Control Measure: An insecticidal powder can be applied around and into the entrance of the nest. Workers are contaminated when they return to the nest and carry the powder inside. A liquid surface spray may be applied liberally and directly to the nest or to the entrance holes of concealed nests.